For a less compressed version, please click on the picture. Dieses zweitägige DMV Studierendenkolleg beschäftigt sich mit dem Thema Unabhängigkeit. In mehreren Vorträgen und Workshops erhalten wir eine Einführung in und einen Überblick über das Thema sowie seine Berührungspunkte mit anderen Teilen der Mathematik, hier exemplarisch unendliche Kombinatorik. Final wenden wir uns in Forschungsvorträgen dem aktuellen Stand der Wissenschaft zu. Das DMV Studierendenkolleg richtet sich an Studierende der Mathematik und verwandter Fächer. Auch wenn die Hauptzielgruppe Masterstudenten sind, freuen wir uns ebenfalls Bachelor und PhD Studenten begrüßen zu dürfen. UnDecidability findet am Freitag den 29. Juni 2018 und Samstag den 30. Juni 2018 statt. Wir sind besonders glücklich keinerlei Teilnahmegebühren erheben zu müssen und bedanken uns herzlich bei unseren Sponsoren! Unter Registration anmelden und auf eine Bestätigung warten. This two days DMV Studierendenkolleg is concerned with the topic of undecidability. In several talks and workshops we will be introduced to the topic and receive an overview, also concerning the intersections with other topics in mathematics (here infinite combinatorics). Finally we will catch a glimps of todays scientific borders in two research talks. The DMV Studierendenkolleg targets students of mathics or similar subjects. Although the main target audience are master students we are looking forward to also welcome interested bachelor or PhD students. UnDecidability will take place Friday the 29th and Saturday the 30th of June 2018. We are especially happy to be able to not collect any attendance fee and thank our generous sponsors! Simply register under Registration and wait for a confirmation. Der Zeitplan ist vorläufig und es kann noch zu Änderungen kommen. Die Registrierung wird aller Voraussicht nach vor 14h öffnen, so dass es zweckdienlich sein könnte bereits etwas früher anzukommen. The schedule is preliminary and changes may still be made. The registration will probably open before 14h, so it might be convenient to arrive a little earlier. With the introduction of the forcing technique in the 1960’s set theory developed a vast amount of new results and methods. Yet it has been argued that nowadays, long after this explosion of results, there is not much interesting research left in the area of forcing and undecidability. We want to put into question this view by showcasing recent research from this area with special consideration on how the “old” questions of independency and undecidability still influence questions in modern set theory. We will focus on two topics: The interconnection between different forcing extensions and the forcing technique itself. The first topic is centered around the so-called set theoretic multiverse and set theoretic geology; the second topic shows how standard forcing works in alternative axiomatic systems like class theories. Finally, we will show what open research questions on these topics are being pursued in recent research. I'll talk about the diverse ways in which infinite trees come up in infinite combinatorics: as structures over which graphs can be decomposed and thereby understood; as a bridge to set theory, topology and game theory; as guiding structures along which proofs can be carried out; and as remarkable structures in their own right. I'll use this unifying theme as an excuse to talk about a variety of topics, such as geometric group theory, topological and structural infinite graph theory, and infinite Ramsey theory. Wir besprechen in informeller Atmosphäre den Wechsel von der Uni in die Wirtschaft/öffentlichen Sektor: Was hätte ich gerne früher gewusst, was hat mir geholfen, was ist der Unterschied zwischen Akademia und erstem Job. This talk will have two parts. In part 1 I will give basic information on cardinals and their arithmetic. In part 2 I will talk about the (potentially) many cardinals that can be found below the continuum (= the cardinality of the set of real numbers). Questions are welcome, already during the talk itself. However, some questions will stay unanswered. The compactness principle is a useful tool in infinite combinatorics which allows to generalise suitable statements of finite combinatorics to infinity. In this workshop we will introduce the compactness principle and learn how to apply it using simple examples. The method of forcing was first used in 1963 by Paul Cohen in order to show that the Continuum Hypothesis (CH) is independent of the axioms of Zermelo-Fraenkel set theory (ZFC). Since then, forcing has turned out to be a powerful tool for obtaining independence results in set theory. In this workshop I will give a short introduction to forcing and its applications; in particular, I will sketch the proof of the independence of CH. The goal of this talk is to survey recent results in the Ramsey theory of infinite groups and more generally, additive structures. In particular, we are interested in finite colourings of an infinite structure (G,+) and finding large sets X in G so that all elements of the sumset X+X are coloured the same; here, one can either allow or forbid repetitions in the sums and both versions of the problem lead to a rich theory. Focusing on sumsets with repetitions, we will see an interesting independence result for the real numbers R: under certain set theoretic assumptions, there are finite colourings of R without infinite monochromatic sumsets; on the other hand, consistently, for any finite colouring of R, there are infinite monochromatic sumsets. Die Anmeldung ist geschlossen. Sollte trotzdem Interesse an einer Teilnahme bestehen freuen wir uns über eine Email an undecidability (dot) math (at) uni-hamburg (dot) de. Sollten wir noch freie Plätze haben, weil etwa Teilnehmer abgesagt haben, besetzen wir diese gerne. The registration is closed. 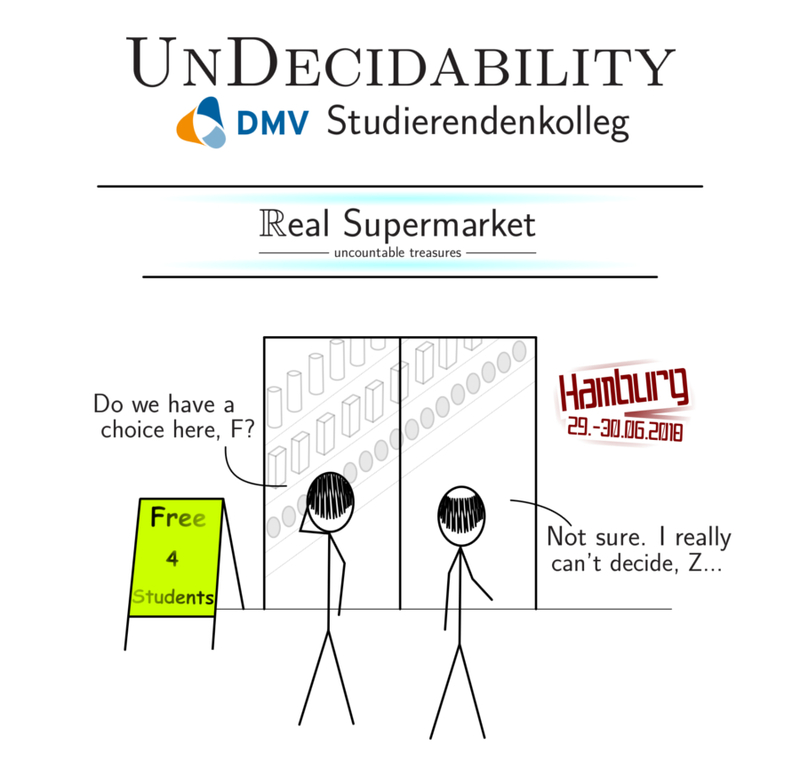 If you are interested in participating nevertheless, we are happy to receive an email to undecidability (dot) math (at) uni-hamburg (dot) de about it. If we still have open slots, eg due to cancelations of other participats, we are happy to fill them. Wir möchten uns an dieser Stelle herzlich bei unseren Sponsoren bedanken, die diese Veranstaltung ermöglichen! Here we would like to sincerely thank our sponsors, who made this event possible! 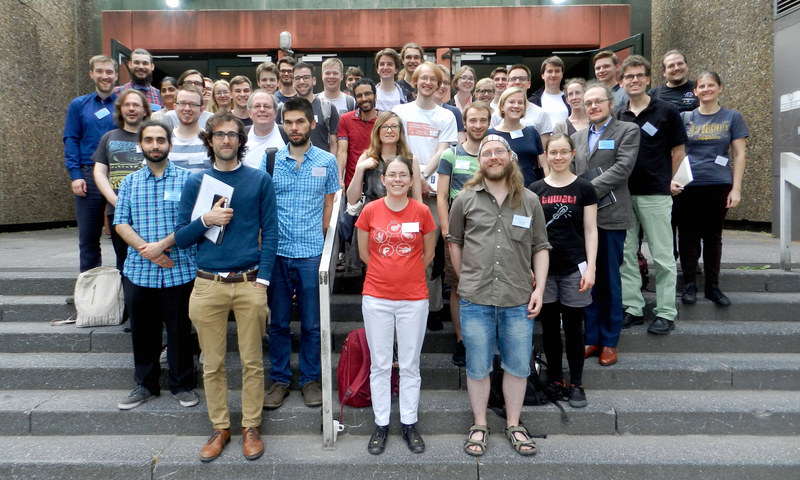 Verein zur Ausrichtung von Tagungen am Fachbereich Mathematik der Universität Hamburg e.V.